Flemington, NJ. – Right2Breathe® Inc., a 501 (c)(3) non-profit organization based in Flemington, NJ and Vienna, VA based Allergy & Asthma Network teamed up to complete free respiratory spirometry exams and provided education about Asthma & Allergies to more than 50,000 racing fans who attended the NHRA Four-Wide Nationals held at Bruton Smith’s Z-Max Dragway in Concord, NC; April 28th – 30th. 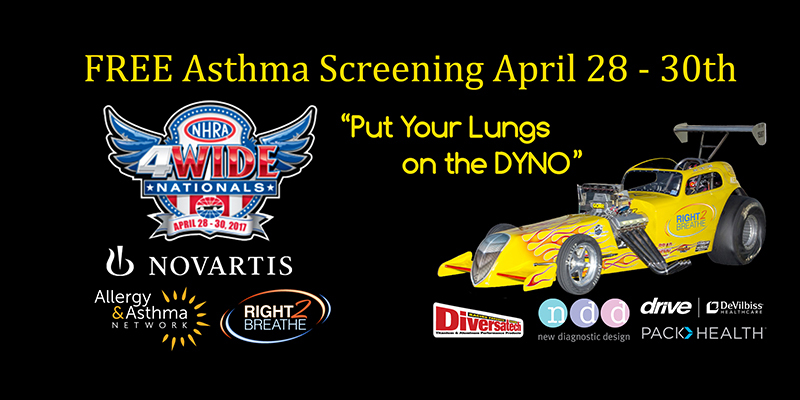 The Right2Breathe® Free Asthma Screening program; which was funded by a grant provided by Novartis®, was the non-profit’s first to be held at a NHRA National Event. 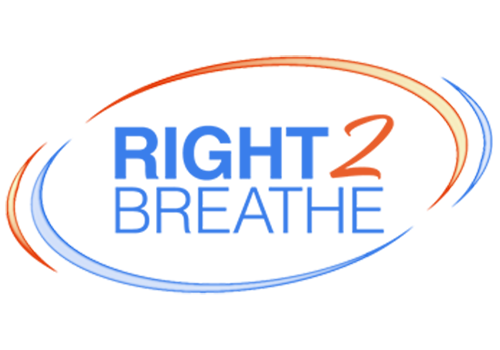 Right2Breathe® rolled out their screening program in October 2016 at the NHRA California Hot Rod Reunion – which was focused on Chronic Obstructive Pulmonary Disease (COPD). At that event, Right2Breathe® completed hundreds of surveys and spirometry exams and engaged with roughly 35,000 people; many of whom had already been diagnosed with COPD. The screening program for COPD, Asthma or any other respiratory disease itself is a two phased process, which includes asking people to complete a five question (for COPD) & 14 question (for Asthma – developed by the American College of Allergy, Asthma and Immunology) survey. Based on the results of the survey, people are then invited to complete a free spirometry exam, a non-invasive breathing test designed to measure lung function. During this screening event, Right2Breathe also posted online survey’s throughout their social media pages, so fans not attending the event could still learn more about respiratory health. During the three-day race weekend, Right2Breathe®’s teams of Respiratory Therapists and RT student volunteers completed more than 450 screenings for Asthma, using EasyOne® Plus spirometry equipment provided by ndd Medical Technologies; which significantly eclipsed the total amount of free spirometry exams completed in Bakersfield. Initial results of the 14-question ACAAI survey discovered that of all those who answered all 14 questions (both onsite and online), nearly 40 percent answered “YES” to 7 out of 14 questions. Of the spirometry exams that were completed in Charlotte, roughly 25 percent indicated lung efficiency numbers that indicate a patient is a higher risk of being diagnosed with a respiratory disease. Right2Breathe® co-founders Joe Morrison and Tim Charlet; second-generation drag racers themselves, found the event incredibly motivating, engaging with fellow racing fans, drivers and crew members and inviting them to “Put their Lungs on the Dyno” during the sensory overload that is the NHRA Four-Wide Nationals. Right2Breathe® is planning to complete more free screening events throughout the eastern United States for the remainder of 2017, and has aspirations of completing similar events across the United States in 2018. If you would like to learn more about Right2Breathe® and how to support their free respiratory screening events, please contact them directly at Breathe@Right2Breathe.org. Allergy & Asthma Network is the leading national nonprofit organization dedicated to ending needless death and suffering due to asthma, allergies and related conditions. Allergy & Asthma Network specializes in sharing family-friendly, medically accurate information through its award-winning publication Allergy & Asthma Today magazine, E-newsletter, http://www.AllergyAsthmaNetwork.org and numerous community outreach programs. Follow Allergy & Asthma Network on Facebook at facebook.com/AllergyAsthmaHQ and Twitter at twitter.com/AllergyAsthmaHQ. Join Allergy & Asthma Network at http://www.AllergyAsthmaNetwork.org/join.